The true king of the trees in the Balearics is the pine. Both the climate and the soil suit it perfectly and it adapts to environments ranging from the aridity of maritime sand dunes, where the wind sculpts them into twisted shapes, to scrubland, lower mountain slopes and the most inhospitable of rock fields. The name ‘Pitiuses’, which the ancient Greeks gave to Ibiza and Formentera, stems from the extraordinary abundance of this species on these islands. Fire has always been the most significant natural problem affecting Mediterranean woodlands. The arrival of man increased its frequency, often with serious consequences. The landscape is a scene of desolation after a forest fire. Lately in 2010 and 2011 there were two big fires in this region. Pine trees that once blanketed the land, now have a pivotal role in our strategy. Instead of building a new leisure centre or a hotel, we’re proposing a natural frame through the site. Lines of pine trees, 10m away from each other, located in strategic position to regenerate the original forest. They act as a link between the coastline and the woodland. 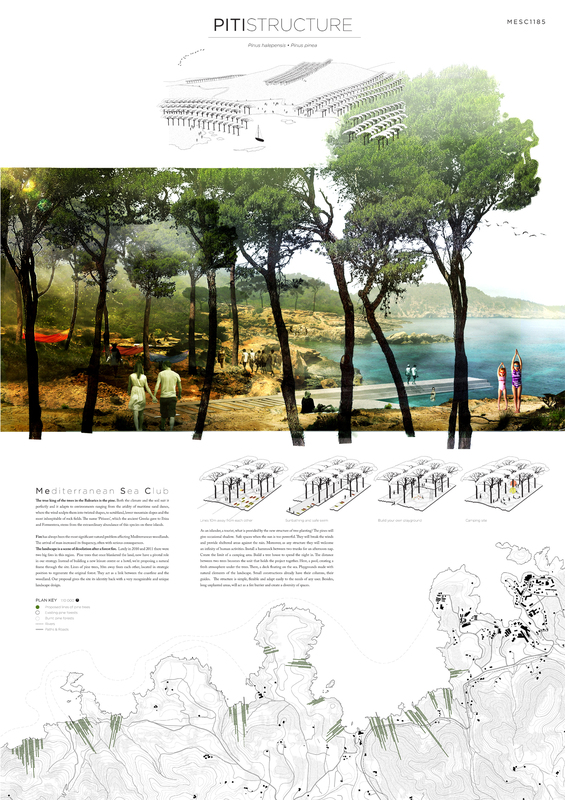 Our proposal gives the site its identity back with a very recognizable and unique landscape design. As an islander, a tourist, what is provided by the new structure of tree planting? The pines will give occasional shadow. Safe spaces when the sun is too powerful. They will break the winds and provide sheltered areas against the rain. Moreover, as any structure they will welcome an infinity of human activities. Install a hammock between two trunks for an afternoon nap. Create the limit of a camping area. Build a tree house to spend the night in. The distance between two trees becomes the unit that holds the project together. Here, a pool, creating a fresh atmosphere under the trees. There, a deck floating on the sea. Playgrounds made with natural elements of the landscape. Small constructions already have their columns, their guides. The structure is simple, flexible and adapt easily to the needs of any user. Besides, long unplanted areas, will act as a fire barrier and create a diversity of spaces.